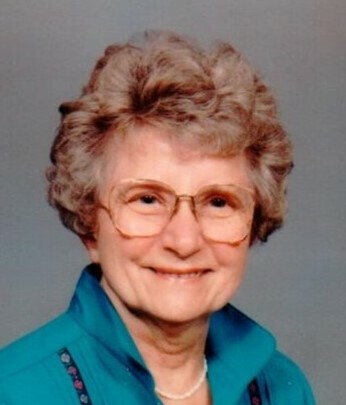 Phyllis Arlene (Wittich) DeRocher, 95, Duluth, died Saturday, March 9, 2019 in Diamond Willow, Proctor. She was born in Duluth on February 15, 1924 to Charles and Minnie (Ruhnke) Wittich. Phyllis was a 1942 graduate of Denfeld High School and received her RN degree from St. Luke’s School of Nursing. She married Robert DeRocher in Duluth on September 20, 1952. Phyllis was a Registered Nurse at St. Luke’s Hospital prior to raising her family. She also worked at the West Duluth Clinic in later years through retirement. Phyllis enjoyed sewing, quilting, needlework and knitting. She was a member of The Lutheran Church of the Holy Trinity and currently a member of Spirit of God Lutheran Church. She was preceded in death by her parents; husband, Robert; infant brother, Marvin; brothers, Glenn Wittich and Vernon Wittich. Phyllis is survived by her children, Paul (Linda) DeRocher, Dale DeRocher and Janet (Tom) Craig; 13 grandchildren and eight great-grandchildren. Visitation 10 a.m. until the 11 a.m. funeral service Thursday, March 14, 2019 at Spirit of God Lutheran Church, 2431 West 3rd Street. Burial in Forest Hill Cemetery. Memorials to the Lighthouse for the Blind would be appreciated. Arrangements by Williams Lobermeier Boettcher Funeral Home.